The use of sludge or ‘tubifex’ worm, Tubifex tubifex, as a live food for juvenile fish has been long practiced in farmers’ fields and it is an important fish food for spawn rearing. Tubifex is found growing naturally in flowing water, particularly in sewage-fed water canals and in open drains with high organic loading. 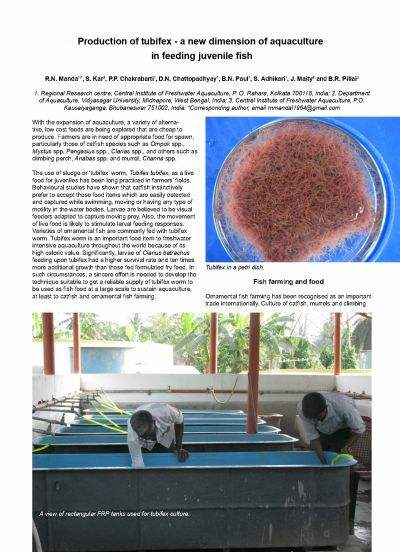 The cost of tubifex worm becomes prohibitive in the dry season, when supplies are limited. We conducted trials to test the feasibility of culturing tubifex using a selection of agro-industrial wastes, namely cattle dung, dairy sludge and rice mill sludge. The trials were carried out over time periods of 10, 20 and 30 days. Net biomass production of all three experiments showed that rice mill sludge had the highest efficiency, with dairy sludge the second best. 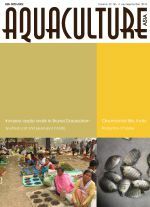 The most efficient culture period was found to be 20 days of culture for both dairy sludge and rice mill sludge fed treatments.